Say what you want about what Marvel has done within the film industry over the past eight years, the fact of the matter is that, for better or for worse, there has never been anything like the Marvel Cinematic Universe and there may never be again. Perhaps it’s for better and for worse. Films like Age Of Ultron drop our faith in the MCU while the recent release of Captain America: Civil War get us salivating for more. There are good and bad ones. That’s why we decided to take a look back, and rank the MCU films, from worst to best. Note – Marvel films outside the MCU, such as the Spiderman films or the X-Men films, are not included. Perhaps the most remarkable thing about what Marvel has managed to achieve over the past eight years with their Marvel Cinematic Universe is that they’ve never really made an awful film. Alan Taylor’s Thor: The Dark World sits at 66% on Rotten Tomatoes, and that’s the lowest score for any Marvel movie. We’re not ranking the Thor sequel last because we’re blindly devoted to Rotten Tomatoes. We’re ranking it last because it’s the worst film from the MCU. Alan Taylor came straight out of his work on Game of Thrones, but television is a very different beast to film. Taylor would go on to make Terminator Genisys, which was a bonafide dud. Thor: The Dark World is uninspired and lacklustre. There are entertaining moments and stand out characters, particularly Adewale Akinnuoye-Agbaje’s Algrim, but it wasn’t enough to lift The Dark World out of its dull sequalitis. The Incredible Hulk is the lost MCU film. Louis Leterrier’s entertaining elbeit unoriginal flick was released in 2008, the same year as Iron Man, which was the film that essential launched the entire MCU. And then it was forgotten, perhaps because when Bruce Banner/The Hulk would eventually turn up again in The Avengers, he was played by Mark Ruffalo and not Edward Norton. Curiously enough, the most recent MCU film, Captain America: Civil War, brought back William Hurt as Captain Ross from Leterrier’s film. The action scenes are well handled, and the actors are fine without being remarkable, but The Incredible Hulk didn’t crack what Marvel has yet to crack on film – how do you make The Hulk a compelling protagonist, and how do you create an adversary capable of going toe to toe with The Hulk, an essentially indestructible mayhem machine? Here’s some trivia – The Incredible Hulk had twice the budget of Iron Man, because it was considered more likely to succeed. Ant-Man was a bit off-kilter and it featured a charming central performance from Paul Rudd, but the rest of it played out relatively similarly to everything that had come before it. Perhaps if Ant-Man had come out earlier, it might have featured higher on this list, but Marvel suffers from repeating itself and playing it safe, and Ant-Man is the perfect example of this. There were also the production troubles, with original director Edgar Wright leaving the project because of creative issues and being replaced by Peyton Reed. Reed did a last minute rewrite with Anchorman director Adam McKay and star Paul Rudd. It shows, and Ant-Man is pretty rough around the edges, as well as creatively chaotic. Perhaps with control from the beginning over the upcoming sequel, Ant-Man and the Wasp, Reed will be able to generate something with a bit more creative enthusiasm. Joss Whedon got a lot of positive attention for his work on The Avengers and a lot of negative attention for his work on it’s sequel, Avengers: Age Of Ultron. One of them most glaring problems with Ultron is that all of the characters sound like Joss Whedon, which means that the film feels like two-and-a-half hours of Joss Whedon talking to himself through the guise of famous superheroes. There’s also too much going on, and too little explanation for any of it. Characters bombard the screen. None of them are particularly interesting. Whedon tries to provide a satisfying story arc for every single one of them, ultimately failing on doing it for any of them. The character of Ultron is disappointingly underdeveloped and his few moments in the limelight fall flat. For a film called Age of Ultron, the whole thing seems to take place over a couple of days. Whedon was also held back by studio demands. There were certain characters and events that needed to be included to set up future MCU films. Age Of Ultron was an indication that Marvel films with too many superheroes just couldn’t work. But then Civil War came out. Thor mightn’t have aged so well, but back in the day – like five years ago. it seems longer – it succeeded thanks to Kenneth Branagh’s flashy direction and a fun central performance from Chris Hemsworth. It’s a Viking/Marvel/Sci-Fi take on the Paul Hogan classic Crocodile Dundee, which is a strange thing to say about a film concerning the Norse Thunder God. The key to Thor was that it didn’t take itself to seriously. Still, Thor is the trickiest MCU character to get right, because he’s just so far from the other Marvel mainstays – Captain America, Iron Man and even the Hulk, in terms of where he’s from and what he’s got going on. He’s also somewhat dramatically limited and enormously powerful, to the point that it’s difficult to see him in any real danger. The power of Iron Man 3 diminishes with every viewing. Writer/Director Shane Black has a natural ear for entertaining dialogue, and there are some remarkable moments in Iron Man 3 (the barrel of monkeys fall from the plane was particularly inspired). But we can’t get past the twist that renders The Mandarin frustratingly dull. The Extremis Virus was also we just can’t get our heads around, and it didn’t feel at home in the world of Iron Man that had been established by previous director Jon Favreau in the first two films. The most underrated film in the entire Marvel Cinematic Universe, Iron Man 2 gets a lot of hate for all its accomplishments. Firstly, Mickey Rourke’s villain Ivan Vanko remains, to this day, one of the most interesting antagonists in the Marvel universe. He doesn’t have a lot of competition, but there is a real sense of menace to Vanko. The showdown on the Formula 1 track in Monaco is also one of the best action scenes in any Marvel film. The plot was a convoluted mess, but everything Favreau threw at the screen was so much fun it never really mattered. Tony Stark became one of the more complicated, in a good way, protagonists in the MCU as a result of Iron Man 2, something that Iron Man 3 would capitalise on. Plus, who could hate a film with Sam Rockwell in it? Although Captain America only really hit his stride in the sequel, The Winter Soldier, what Joe Johnston’s Captain America: The First Avenger managed to do was take what should have been an outdated character, considering the cynicism in contemporary superhero films, and rendered him compelling. The Winter Soldier would make the Cap relevant, but The First Avenger laid the groundwork for what was to come. Chris Evans’ performance was spot on, the World War 2 setting was something different to what we’d previously seen in the MCU and Tommy Lee Jones was in it. Plus, the film introduced Bucky Barnes, who would go on to become one of the most significant narrative forces in the entire Marvel Cinematic Universe. The film that kickstarted it all. Jon Favreau’s Iron Man exceeded everyone’s expectations, both commercially and critically. Robert Downey Jr.’s performance was a knock out and set Tony Stark up to be one of the biggest drawcards of the MCU. So perfect is Downey Jr. as Stark that it’s difficult to imagine how the MCU will continue to flourish now that the actor has announced his intentions of stepping back from the universe. Iron Man may not be as flashy in comparison to the latest MCU releases, but it was a good film. DC Comics have tried to emulate Marvel’s success on the back of Man Of Steel and Batman V Superman: Dawn of Justice, without luck. Perhaps that’s because only quality engenders real success. In light of the two Captain America sequels, The Avengers hasn’t aged as well as it might have, but Joss Whedon’s achievement is impressive nonetheless. The Avengers put Iron Man, Thor, The Hulk, Captain America, Black Widow and Hawkeye into the same film and made it feel like they all belonged (maybe not Hawkeye). It’s the ultimate summer blockbuster – lighthearted, fun, great action scenes, buddy chemistry and funny. It was the archetypal example of superhero ‘end of the world’ films (cities being levelled with little thought toward the consequences), which have since been shunned somewhat by fans in favour of more contained films, but the thrill of seeing such iconic (or should we say, icomic, eh?) on the screen together made everything else seem irrelevant at the time. Nobody expected Captain America: The Winter Soldier to be as good as it was. Directors Anthony and Joe Russo were coming off work in television, on the show Community, and had minimal experience in feature filmmaking. But somehow it was amazing. The Winter Soldier demonstrated that Marvel was capable of tacking serious themes with intelligence and depth. It felt more like an espionage thriller in the vein of 3 Days of the Condor than a superhero film, suggesting that Marvel is best when it breaks from that stale formula that bogged down Thor and Ant-Man. The action was brutal and exciting, something the Russo Brothers would improve on in the follow-up, Civil War. But perhaps most remarkably, The Winter Soldier took the character of Captain America, a man out of his time with antiquated attitudes, and made him relevant to a contemporary audience. In a world of dark, cynical superheroes, audiences discovered that doing the right thing isn’t so uncool. The latest, and the second greatest. Captain America: Civil War did what Avengers: Age Of Ultron failed to do and did what The Avengers did, but better. The problem with Whedon’s films was that there never felt like there were consequences to any of the actions and the characters never felt like fully realised people. Civil War is the realisation of eight years of the Marvel Cinematic Universe. It’s a considered development of not only the characters but everything that happened to them in the previous twelve films. One thing is for sure – the MCU will never be the same again. The Avengers had five main characters but had five films leading up to it to establish them. And they were famous anyway. Guardians of the Galaxy also had five main characters, none of whom the average film goer had heard of, and established them and provided a satisfying narrative, all in the one film. 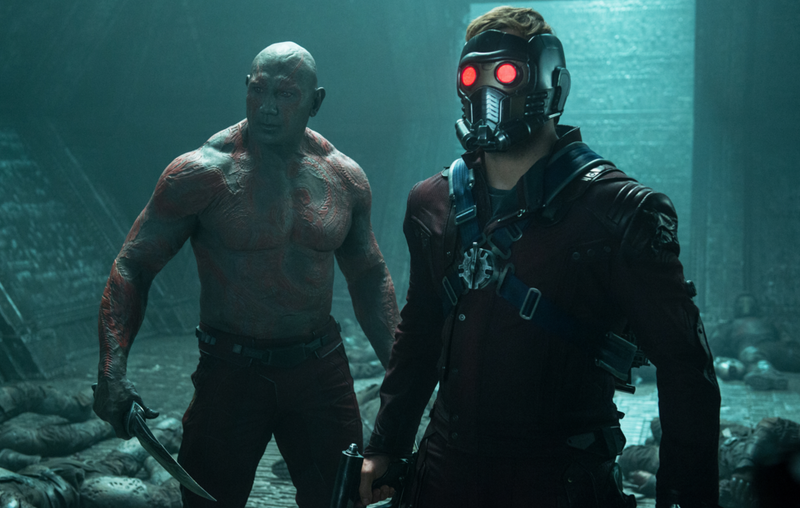 Guardians shouldn’t have succeeded, but it did, thanks to an absolute understanding of how best to exploit the genre and his characters from director James Gunn. It felt like Star Wars and left you hanging out for an Empire Strikes Back. It’s unlikely that the Guardians will stay out of the rest of the MCU, which is a shame, because it works wonderfully as a standalone franchise. How often do you go to the movies and see a film with no bad bits in it? Guardians of the Galaxy has no bad bits in it.